I always wondered about posts and videos reporting laptop and cell phone battery fires. I do not have to any longer. My husband has a Dell Inspiron 15 7000. He closed the lid on it Thursday night and left it on the couch. The laptop goes to sleep and everything is good. Friday morning the laptop started smoking. This is what we found after tracking down the funky smell. 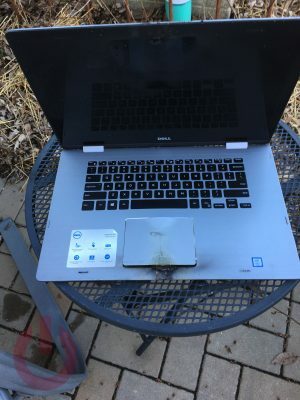 Mmmm, crispy laptop, burned plastic, and singed couch. I am guessing based on the protrusion of the trackpad that the battery exploded. I called Dell to raise a case. The laptop is a little over a year old. This puts it out of support. The handy automated call system reminded me. As did the support tech who answered my call. This is a safety issue. If it had happened at a different time, overnight or no one home, it would have been much worse than a ruined laptop and a singed couch. I will post when Dell gets back to me with next steps. Holy schnikes!! That’s crazy. Glad to hear that nothing serious happened….and also terrifies me as I’m using my work’s Dell laptop as we speak. Keep us posted on response from dell! Wow! Very fortunate that you caught it. The battery in my XPS 15 also had issues too, but it only got swollen enough to break the trackpad. Hope Dell does the right thing for you. Definitely keep us updated. Dell originally said they would have a response yesterday. When I did not hear, call or email, I called them. Now it supposedly they will call today or tomorrow and email with next steps. Wow this is totally scary! I own several Dell laptops and I don’t want to leave them plugged in anymore! This is crazy! I hope dell takes notice of this ASAP. You are lucky it wasn’t a lot worse! Please be careful! Was there any warning?! There was no warning. The laptop was completely normal the night before and then was not the next morning. It was not plugged in either.